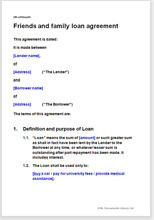 This is a simple loan agreement suitable for lending to friends or family. Use this document when you need to record the loan, but where you have a high level of trust with the borrower. Lending to friends and family can be a difficult. A written agreement may seem too formal or raise questions of trust. But not using one can result in confusion about the terms, or mistaking the loan as a gift. After considering whether you want to be a lender, working out how to protect your money without seeming to question the integrity of the borrower can be challenging. This agreement is simple in order to bridge the gap between not using an agreement at all, and using a longer, more comprehensive one. It is, however, legally binding and enforceable. It could be used for situations such as short-term lending to a friend or family member to buy a car, or for longer period loans for a deposit on a property, or to fund an event or large purchase. Either party may be abroad or in the UK, and the loan can be of any size. This agreement contains no provisions for security or for a guarantor. If you want to bring in a guarantor, this document may be more suitable. "Simply you are easy to work with and reasonably priced. I could edit the document . This word version was exactly what I was looking for. We were easily able to replace old out of date forms."